Options available include SCSI hard disk drives, a large library of sampled sounds, special memory expansion kits increasing overall sample memory to 4-megabytes, plus survival kits & a service diagnostics software disk. 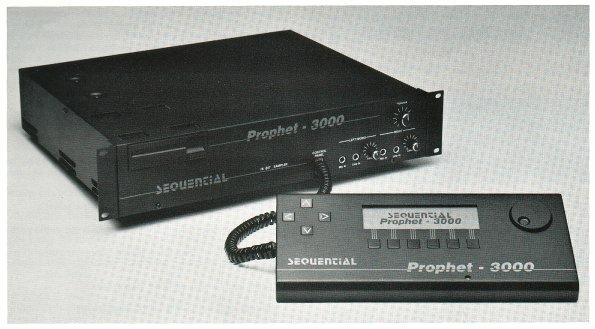 Sequential® Prophet® 3000 custom IC No Longer Available! The Sequential® #I-627 Rev.A, PGA style voice output custom ICs, is a complex chip that converts sound RAM data into data for all of the voices, adjusts sample playback for the desired pitch, controls sample start/end/looping points, synchs the playback of stereo channels, & controls refresh for the dynamic sound RAM. The #I-627 Rev.A PGA chip was also intended to adjust for different RAM chip configurations. Unfortunately, a design flaw in the #I-627 Rev. A custom PGA IC failed to accomplish this task. Nearly all Sequential® Prophet® 3000s were manufactured with the PGA style #I-627 Rev.A. Because of this design flaw, nearly all Sequential® Prophet® 3000s are unable to expand the sample memory to 4-Megabytes of RAM or beyond. The redesigned #I-627 Rev.B PLCC style custom IC corrects this flaw. The #I-627 Rev.B allows the Sequential® Prophet® 3000 to recognize the presence of the 16 DRAM (#I-090) memory ICs when installed into the 16 empty sockets located on the Sequential® Prophet® 3000's main. PC board (as originally intended). Unfortunately, replacing the #I-627 Rev.A GA style IC with a #I-627 Rev.B PLCC style IC is an extremely complicated modification that lacks any clear & precise technical documentation. The Sequential® #I-628 custom IC is also no longer available.